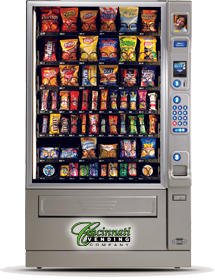 Cincinnati Vending is a full service vending company providing quality foods and name brand snack and refreshment products. Our À LA CARTE order system leads the way in bringing the power of name brand & private label quality foods individually tailored to satisfying your employee needs, wants, or demands. It’s our commitment to providing you the highest quality products and the utmost in service. It all adds up to a refreshment program that not only works, but works for you! Good Food, Better Variety, the Best Service. Healthy Vending. Serious about Nutrition. To remain at the forefront of vending, Cincinnati Vending places emphasis on utilizing emerging technologies that enhance the users experience with machines that run smoother, respond faster, and create an entirely new vending experience. Cincinnati Vending is proud of its service record. Our clients and customers appreciate the difference when it comes to the important issue of service, reliability, and quick response time. Our service department is available 24 hours a day, 7 days a week. Cincinnati Vending is excited to introduce USConnect, an innovative new loyalty and rewards program offered in conjunction with a cashless payment. It's always great to be rewarded and with One Card you'll be rewarded with every purchase. Card holders earn 5 reward points for every dollar spent and redeem online for cash back on your account. You'll earn up to 10% back everyday! We believe in helping our communities and we bet that you do too! That's why at participating locations we donate 1.5% of every dollar you spend with your OneCard to the charity of your choice. Now you can get something good and do something good at the same time. Cincinnati Vending offers promotions, commissions or price roll backs to customers who generate sales in excess of 400.00 per machine per month. These can be simple product giveaways or turkeys at Thanksgiving, to sporting events or local hotel stays to cash back for employee perks. Each customer’s promotional or commission activity is determined by a formula based on sales, pricing, and additional equipment provided. Our updated designs and modern styling creates a better, more accommodating environment in your location. And with more product selections our machines make a perfect fit for your environment. © Cincinnati Vending Company | All rights reserved.